Tandem paragliding is easy and natural way to feel the magic of flying like a bird. No need of previous experience. The PANORAMA flight is 15-25 minutes calm flying in big space. The most often comment is the beautiful view like on a map and the relaxed feeling.. Peaceful! The ACRO flight lasts about 5-15 minutes and consists of 2-3 G acrobatic maneuvers like SAT, deep spiral, wingover... Cool! The CROSS-COUNTRY flight can continue up to 1 hour. The 10-30 kilometers of distance are covered by soaring air currents and flirting with clouds. Fusion with nature and nirvana. Welcome back! HD Video and/or pictures for all flights - 15 € -please request your video recording in advance. The tandem (bi-place) paraglider is with big surface and is certified to fly with up to 240 kg pilot and passenger. You just sit in a comfortable seat, attached to the glider and your instructor, who takes care of everything. If you're courageous then you can take the controls and fly the paraglider ... or you can just enjoy the view from above. Flying without vibrating and noisy engine depends entirely on weather. This is the price to be in harmony with nature. To not disturb anyone. One of the main weather factor's is the wind speed and direction. We don't fly in strong wind. In moderate wind, the flying is done from sites with suitable exposure. Throughout long years of experience and thousands of tandem flights, we continue to develop thorough meteorological knowledge and you can trust our recommendations about time and place for flying. Mind that all weather forecasts are reliable for 3-4 days ahead and nobody can guarantee good weather for certain day in future. Thus if you want to fly during the weekend, then you have to call us at Wednesday, Thursday or Friday. If you still insist for a certain date - for example a friend's birthday, then consider buying gift voucher for tandem flight, which you give in a suitable moment. Then your friend can do the flight at the first opportunity. We fly all year round, every day, from dusk to down (sometimes even at moon light :) About 70% of days are suitable for flying between April and September. The cross-country conditions in Bulgaria are between March and September. 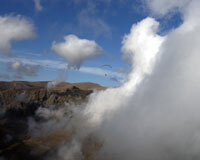 The paragliding flying sites are charming places in Bulgaria with glorious nature and deep history. They would be also interesting for your non flying companion. *Mind our additional transport expences. We use quality equipment from a prestigeous swiss producer.